There are several factors close to my heart in Miss you like Hell. I am a fan of Playwright Quiara Alegria Hudges. I even feel she is my 'theatre godmother' in a way, being that In The Heights was my first big project in the musical theatre world. I was born in a Mexico-United States border and, I am a Mexican immigrant residing in the United States. As I came into the theater, I tried to draw a blank and just enjoy the show. The border and immigration topics are ones that -I feel- have been the only thing discussed on the American stage when it comes to Hispanic, Mexican, Latino people/stories. Usually it has to do with a missing identity, a lack of identity with the immigrant parents of now American children and so on... Quiara has heart and her pieces stand out because they have that, heart. Miss you like Hell is not an exception. 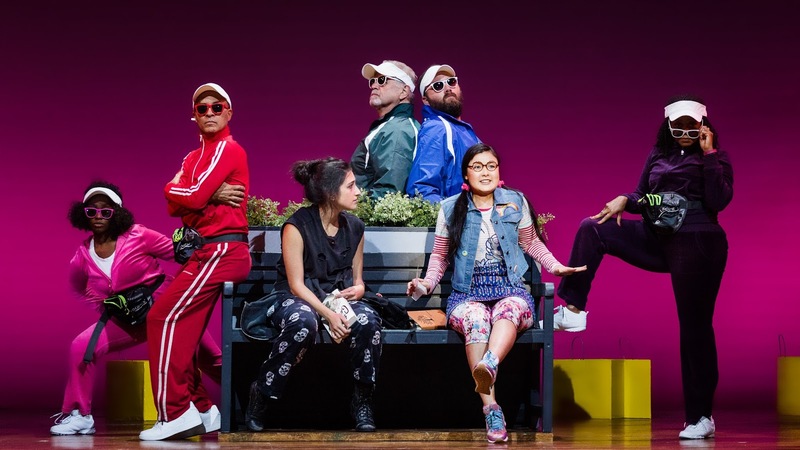 Its transition from paper to stage was boosted by a killer creative team: Music and Lyrics by Erin MccKeown, choreographed by Danny Mefford and Directed by Lear deBessonet. 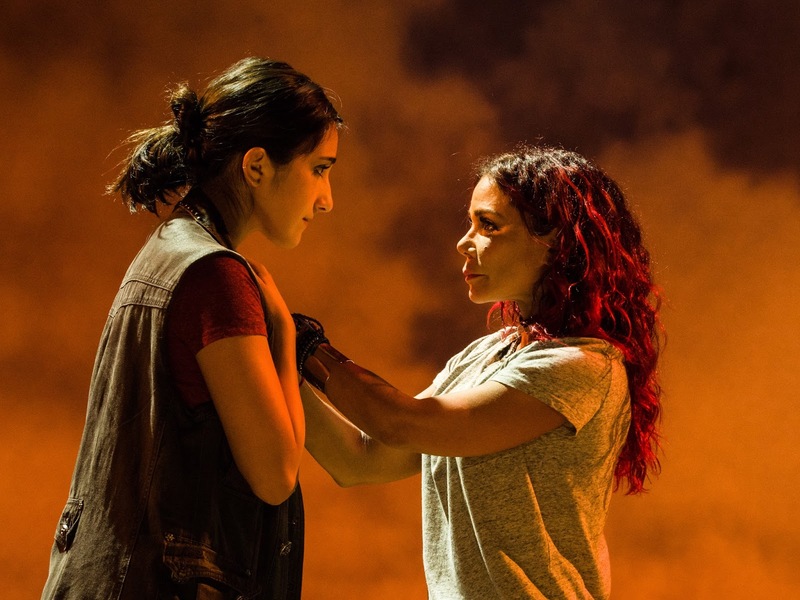 Krystina Alabado and Daphne Rubin-Vega (right) in MISS YOU LIKE HELL photo by Jim Carmody. Beatriz (Daphne Rubin-Vega) is a free spirited, youthful, hip mother who was not able to stand the Philadelphia cold, nor the bad marriage she was in. Leaving daughter Olivia (Krystina Alabado) behind, for a new and sunny beginning in California. That is, after a nasty custody battle but, always looking after Olivia from a distance. The 16 year old never understood why she was 'abandoned', why her mother never taught her Spanish and, thanked everyday for the internet. Besides googling her life questions, she vents in her 'anonymous' Tumblr page.With a considerable following, that Olivia named castaways...Identified and all. She reaches out for comfort, rapport and different stories. Beatriz finds the anonymous posts and as soon as she reads -possible suicide-, she jumps into her truck towards her troubled teen. Convincing her to join in on an adventurous road trip. The illustration of the 'tumblrs' or well, Olivia's blog followers was in definite, my favorite part. Mefford's choreo stands out and brings each and everyone in the ensemble to shine. One of San Diego's sweethearts (and one of my faves) Cashaé Monya as Pearl, is a total joy to see. 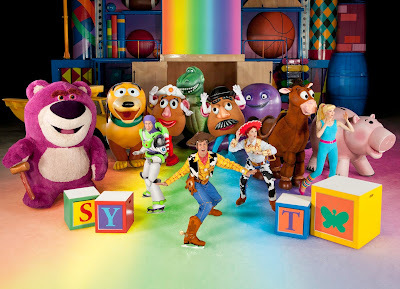 Cliff Bemis (OMG star struck), Victor Chan,Vanessa A. Jones, David Patrick Kelly, Julio Monge, Kürt Norby and Olivia Oguma. What a thrill to embrace the iconic Daphne Rubin-Vega on a San Diego stage! Props also to Kaitlin Shaw, responsible for casting. I saw Krystina Alabado in the touring production of Evita a few years back, and thought she was great. I love the fit she makes as Rubin-Vega's daughter. Several angles are explored in this musical. Millenials, social media, broken relationships, misunderstood identities, not knowing Spanish and immigration. There is a point in the piece where Olivia yells at her mother, who she calls 'Beatriz'... "I am not Mexican!" to which the Oaxaca blooded woman responds "IGNORANTE!". One little detail that escaped Beatriz, is that she's on route to a deportation hearing in Los Angeles. She needs Olivia to testify on her behalf...the resolution will reach out and touch your heart. Look, 80% of the women in my family, including myself, have married foreign men (not Mexican lol) I can totally relate to these remarks with my nieces and nephews. As always have hoped that my children (that don't exist yet) never rant that to me. (and that they speak Spanish -fluently-). "Miss you like Hell premiered as the President election – with its incendiary rhetoric surrounding borders and walls – wrapped up, history has shown us that vitriol surrounding “the Other” remains a constant. It is a musical for this moment precisely because it asks us to consider “the Other” inside ourselves. To be American is to be so many different – perhaps contradictory – things, all at once. Miss You Like Hell doesn’t just illuminate this, it celebrates it." The cast of La Jolla Playhouse’s world-premiere musical MISS YOU LIKE HELL. photo by Jim Carmody.